By late '87, I had run about 20 marathons and three or four ultra-marathons (including the 200 mile race). I was beginning to burn out on running. So, I bought a road bike from a very nice guy named Sandhani. My plan was to start triathlon training. I got some help on the bike and local bike routes from another very nice disciple named Krandan -- a great character originally from England, then hailing from Switzerland. He took me on a number of 50-mile rides out to Oyster Bay that were breathtaking, in more ways than one. For help with swim training, I turned to three disciples who were training to swim the English Channel: Shraddha, Sunil, and Dhruva. A few nights a week, they would drive out to Hofstra University's Olympic-sized pool and seemingly swim forever. The first time they brought me out there, I remember walking out onto the pool deck in my baggy running shorts and being slightly embarrassed by the sight of the three of them in their Speedos. To put it mildly, they didn't look athletic. An integral part of Channel Swimming, however, is preparing oneself for the cold. And from my point of view, they looked prepared! Once in the water, though, the three of them moved like the marine mammals they were becoming. That first trip to Hofstra, I swam 400 yards in 50 yard increments. I thought I was going to drown. I got out, showered, dressed, and then sat in the pool deck bleachers for near two hours while the three of them continued their mammoth workout. Later that summer (1988), Sunil, Dhruva, and Shraddha made the 342nd, 344th, and 345th solo crossings of the English Channel, respectively. The very first disciple to swim the English Channel was a German woman named Vasanti in 1985. She was closely followed by the first male disciple to make the crossing -- Adhiratha -- that same year. Shortly after their victorious swims, Vasanti and Adhirhatha returned to New York where Guru held a celebratory function in their honor. It was -- hands down -- the best function I ever attended. The highlight of the night was when Guru had Vasanti and Adhiratha stand on the stage while the disciples filed by, one by one, to shake hands with them. What great memories I have of that night. In any event, at around the same time Sunil, Shraddha, and Dhruva were completing their own Channel swims, I was suffering in my own way. That summer, the Olympics were being held in Seoul, South Korea. Guru and a number of disciples made the trip, particularly to see Carl Lewis, whom Guru had given the spiritual name Sudahota. In the afternoon of the 100 meter finals, Sundar and I did a brutal hill workout, picked up dinner to go from Annam Brahma, and went to my place to watch the Games. That's when I began feeling sick. Without touching my food and before the 100 meter final was run, I excused myself and went upstairs to my room. I had a devastating pain in the lower right portion of my abdomen. Very quickly I realized I should go to the hospital. I called Trishatur -- whom I'll profile a bit later on -- and he agreed to pick me up. It was the beginning of a horrible Friday night. On March 10, 2002, Sunil passed away unexpectedly. As I recall, his spiritual name meant "blue, Krishna's blue." 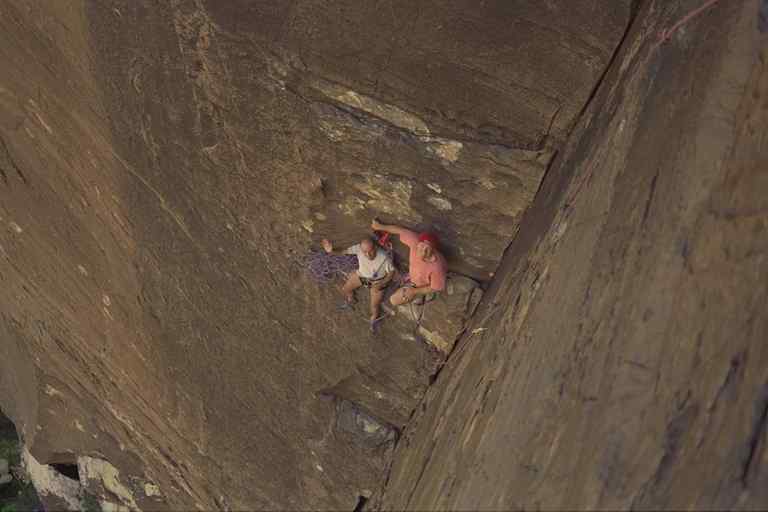 After successfully conquering the English Channel, Sunil became a mountain climber. 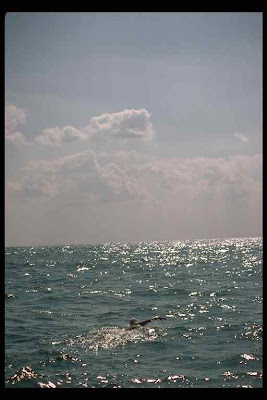 The picture above is Sunil swimming to the beyond, taken by his close friend Shraddha. The original, along with many other great shots of Sunil, Shraddha, Adiratha and others can be found here. Great photo of Sunil. What a good guy he was.